There weren’t too many surprised faces inside the Honda Center as the Los Angeles Kings once again came through in a tight spot to win game 7 of the conference semifinals, beating the Anaheim Ducks 6-2 and making it to their third consecutive conference finals, facing the Chicago Blackhawks once again. Before the Kings start thinking how they’re going to make it against the Stanley Cup champions and a team that beat them in five games last year when the two met at the same stage, it’s time to appreciate the comeback with two wins in games 6 & 7, that also send Teemu Selanne into retirement after 22 seasons in the NFL, spending the last nine of them with the Ducks. Game 7 also might have been a finale for Saku Koivu, as the 39-year old center will decide on retiring or carrying on in the next few weeks. It’s got to be a lot of happiness later, but it is hard right now. It was going to be ending in a great celebration or a big disappointment, and we didn’t get the win. It will be great memories I will live with for the rest of my life. I would never have expected to have this kind of career. I am very thankful for that. For the Kings, this was another one of those rising to the occasion moments from a team that has seen it all through the last few seasons and whenever things get close and tight, they seem to pull through. The conclusion? Knock them out early, or it’s going to be a lot of trouble. The Kings left no doubt who rules Southern California, and who was going to come out as the winner from this one. They took a 3-0 lead in the first period with goals from Justin Williams, Jeff Carter and Mike Richards, mostly building on their great defense to create those scores. Jonathan Quick made 25 saves out of the 27 attempts at goal and the Kings made the most of their power plays throughout the game (2-of-6 compared to 0-for-3 for the Ducks). The Kings were up 5-0 by the time the Ducks got their first goal in the second period as Marian Gaborik scored his ninth goal of the postseason. The Kings have now been able to stave off elimination in two series, improving to 6-0 when facing elimination this spring, and are 7-1 over the last two years with the sword hanging over their heads. 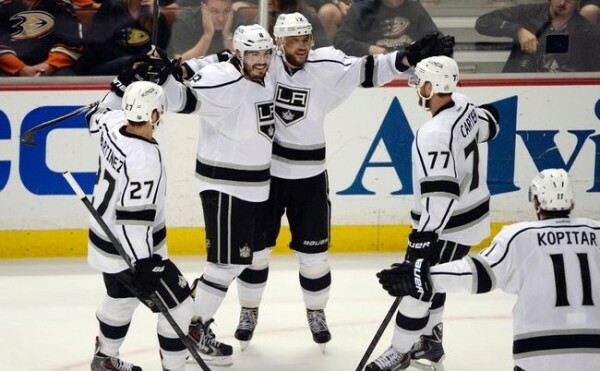 Despite a disappointing regular season, Drew Doughty might have it right: This team was built to win in the playoffs.